We hope that our site was useful and resourceful to you. If you manage a website or blog and feel others can benefit from our material, feel free to link to us using any text link of your choice. You can also copy any of the following code snippets and insert them into your website. We really appreciate your support. 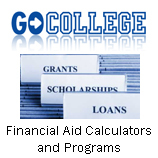 GoCollege - get ready for admissions, find finacial aid, become a better student, and survive college. GoCollege - get ready for admissions, find financial aid, become a better student, and survive college. Check Out Our NEW Financial Aid Tool!! !